Just a few weeks ago, on July 21, the U.S. burned through 40.9 billion cubic feet, the highest volume on record, according to the EIA. And in late July, the power burn exceeded 40 Bcf/d three times due to a hot weather. Nine of the ten highest power burn days on record took place last month, with the other one occurring in July 2015. Average consumption of 36.1 Bcf/d in July of this year was 2.7 Bcf/d higher than a year earlier, and 1.5 Bcf/d higher than the previous high reached in July 2012. While high demand is keeping natural gas from being diverted into storage in large amounts, the other main reason that natural gas inventories are not building up as much as previously thought is because of a supply-side issue: natural gas production is actually falling after years of steady increases. 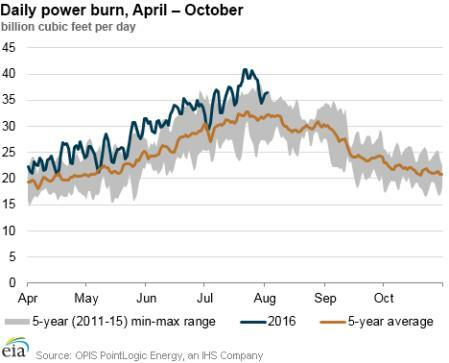 Natural gas prices have traded below $3 per million Btu since the beginning of 2015. U.S. gas drillers continued to ratchet up production through 2015, however, creating this past winter’s inventory glut. But the resulting downturn in prices has now made drilling unprofitable in many areas. On top of that, the oil price crash has ground oil drilling to a halt, which means that the natural gas produced in association with oil has also come to a standstill. The upshot is that natural gas production is now falling in the United States. 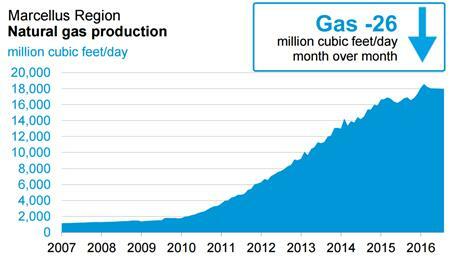 The Marcellus Shale, the most prolific shale gas basin in the country, saw production peak in February at 18.5 Bcf/d. Since then output has declined 3 percent. In August, the EIA expects gas production from the Marcellus to fall by another 26 million cubic feet per day.